A spinner ring is one of those unique designs that you will enjoy making and wearing. In this class you will learn how to measure your sterling silver sheet so that you will have a perfect fit for your ring. The techniques that you learn in this class will make sizing any band type ring a breeze. You will have your choice of sterling silver material for your outer ring (the spinner) so that your ring will suit your style. 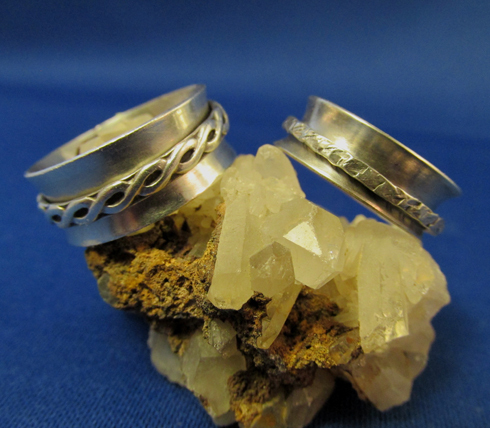 The kit includes enough Sterling silver sheet and wire to complete your ring. We will be using silver paste solder and small butane torches in class. You will have the use of instructors tools while in class and receive a complete tutorial.